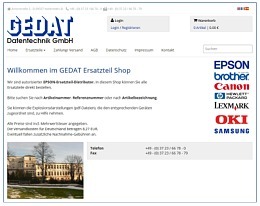 GEDAT Datentechnik is authorised distributor for EPSON spare parts for Europe, Africa and the Middle East. In our spare parts shop you can find exploded diagrams of EPSON devices. Select a spare part with reference or item number and buy immediately. The shop prices include 10% discount. Discounts are granted only if you buy from our internet shop or if you order via telephone by giving us the item number. In the spare part shop you find also exploded diagrams of many devices. Select the desired spare part with item number or with the help of exploded diagrams and order directly. Please note that: To install spare parts by yourself you need specific know-how, skills and tools! If you have questions concerning guarantee read our general business terms or give us a call. We would be glad to assist you.